I am the mother of two daughters from China, both of whom were born with limb differences – specifically hand differences. As far as special needs go, my daughters’ diagnoses are no big deal and really don’t affect our lives much. I once read on another mom’s blog that “hands are over-rated”. We’ve learned that this is true! Our older daughter, now 6 1/2, was not a “special needs” child. When we decided to adopt we had already been through the infertility merry-go-round and were just ready to have a baby. We had marked “yes” to some mild special needs but requested a healthy infant, as young as possible. When Katherine’s referral came our social worker told us her name and age (only 7 1/2 months!) and then cautioned that she had a special need. My husband and I were both special education teachers at the time and both of us immediately began thinking of serious medical issues – spina bifida! cerebral palsy! seizures! Our social worker explained that our baby had an extra finger (actually a “thumb”). We were weak with relief. An extra digit was an interesting quirk, not a true special need! And really, it wasn’t. Katherine came home in November 2004. Our doctor here officially diagnosed her with polydactyl of the right hand. He told us that it was fairly common and tended to run in families. We have often wondered if someone in Katherine’s birth family also had extra fingers. 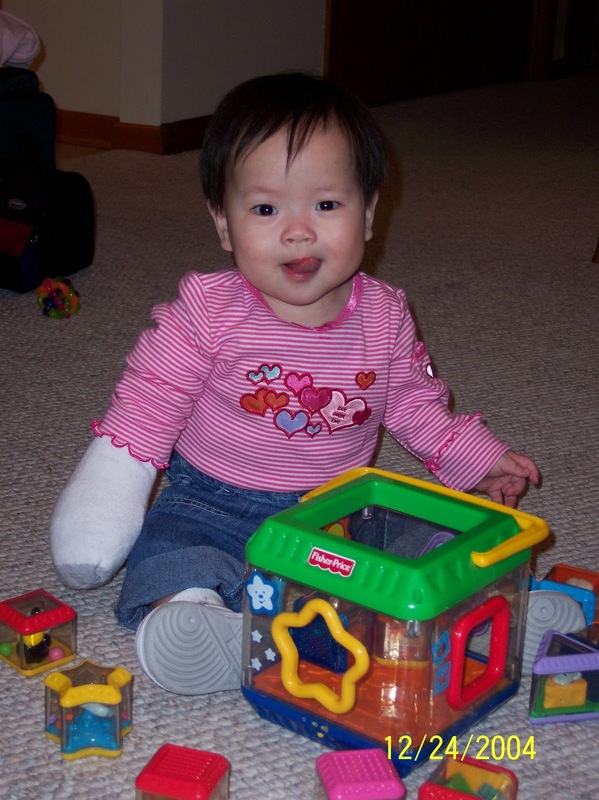 Six weeks after arriving home, Katherine had surgery to remove her extra “thumb”. It was an outpatient procedure and she went home the same day. She had to wear two different casts that covered her from fingers to over her elbow for six weeks but that didn’t slow her down in the least. She required no further treatment. Katherine has a scar on her right hand and that thumb is slightly smaller than the other, but you would never notice unless you knew to look. She is rather proud that she used to have 11 fingers. When we decided to adopt again we told our agency that we were very interested in a child with special needs. Our experiences with Katherine’s hand issues had been no big deal and we felt we could handle a broader range of special needs. 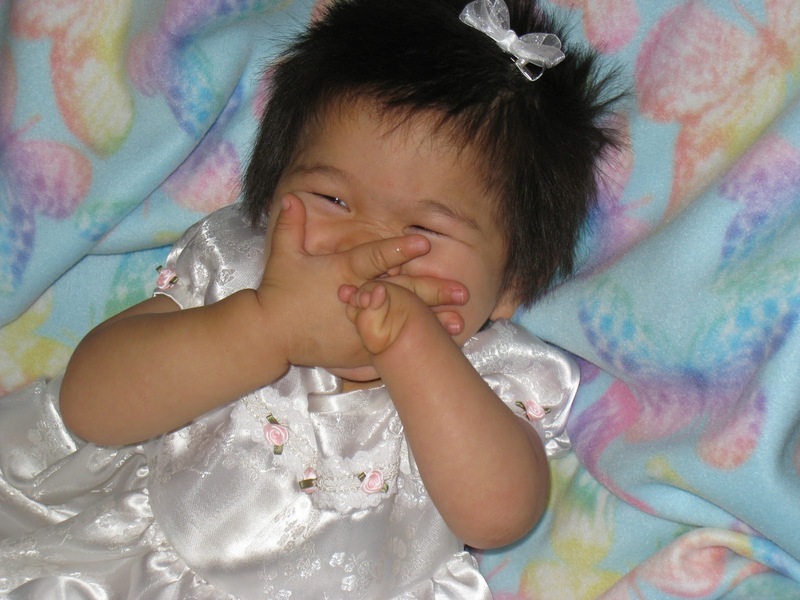 We knew that the whole adoption process has slowed dramatically and that made special needs even more appealing. However, our agency was small and received Waiting Child lists infrequently. So we waited. And waited. When the special needs program in China was overhauled, our agency did not receive a Waiting Child list for a year and a half. I started looking at lists shared by other agencies. I quickly realized that I was drawn to children with limb differences. I inquired about a number of different kids, but none was still available. I followed other people’s travel blogs and studied the special needs children. I remember seeing one little boy with a missing hand and thinking “That would be an interesting special need.“ After three years we were discouraged and really tired of waiting. Our home study was due again, so we filled out another special needs checklist and told our social worker “We’re REALLY interested in a special needs child, especially one with limb differences.” A few weeks later she called us about Rachel and we immediately knew that this was our daughter. Rachel’s referral described her has “missing her left palm and fingers.” She was beautiful! Her hand looked exactly like that of the little boy in the blog I’d seen months before. We settled in for the horrible 4 1/2 month wait until travel and spent a huge amount of time staring at Rachel’s pictures. We had photos of her hand, but no diagnosis and no real information about it. We didn’t really care. We knew she was ours and that she’d probably do lots of amazing things, even without a hand. Rachel came home in September 2009 at the age of 21 months. As we had guessed, she did and continues to do everything that she wants with her “little” hand. It was important to me to have a diagnosis, a name for Rachel’s condition. Our doctor referred us to an orthopedic specialist who referred us to Shriner’s Hospital. At Shriner’s (a fabulous place, I might add) Rachel was diagnosed with symbrachydactyly. This is a rare birth defect caused by an unknown something interrupting the blood flow to the limb bud during the second month of fetal development. It is not genetic and is associated with no other abnormalities. In Rachel’s case her left forearm is shortened and she has a wrist and the heel of her palm. Her fingers are little nubbins. The doctor’s proclaimed her healthy and beautiful and assured us that “She’ll be fine just as she is.” And that is true. Rachel will be 3 next month. She does everything any other almost 3 year old does. Everything! She dresses herself, including putting on her shoes and socks, rides a tricycle, cuts with scissors, zips up the climbing wall on the swingset, strings beads, and opens every jar, cupboard, and container she can get her hands on. Her problem solving skills are excellent. Someone once asked me what kind of adaptations we had made for Rachel. I replied that we had put locks on a lot more things than we ever had before! Rachel figures out on her own how to adapt tasks to her needs and we just follow her lead. She is fearless and persistent and determined to do everything. So we let her. I’m sure there will eventually be tasks that just can’t be mastered one-handed, but I’m not worried about it. After all, so you really need to knit or play the saxophone to have a full life? Katherine once made the observation that “I had too many fingers and Rachel doesn’t have enough.” It all works out in the end. Hand difference really aren’t a big deal. My girls prove that. You can follow along on our everyday adventures here.